olympic champion buddy lee teaches jump rope. unbelievable moves here. there really is a jump rope in that picture somewhere! power and ease. linear and circular motion. mutuality. flow. a few more buddy lee videos at crossfit.com. 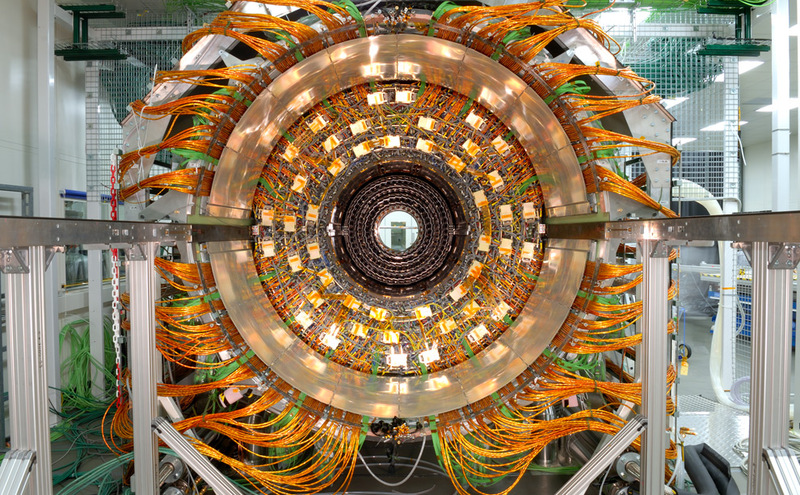 More pics of the LHC. Gorgeous. And what does it actually do? The Large Hadron Rap breaks it down, pretty hilariously. Nineteen years ago this week, I graduated from the University of Chicago’s Graduate School of Business, having studied Finance and Healthcare Administration. After two years of working long weekdays to crunch financial projections for huge hospital projects and working long weekends training for and leading Chicago Center Outward Bound programs for high school kids, I quit my “day job” and went north to Ely, Minnesota, and the Boundary Waters Canoe Area, to lead wilderness trips for the summer. The plan was to return to Chicago and run corporate programs to support the youth programs, but the Chicago Center closed a month after I returned from Ely. With only two years of “real” work experience, I dared to be self-employed rather than unemployed — and that’s what I’ve been ever since. 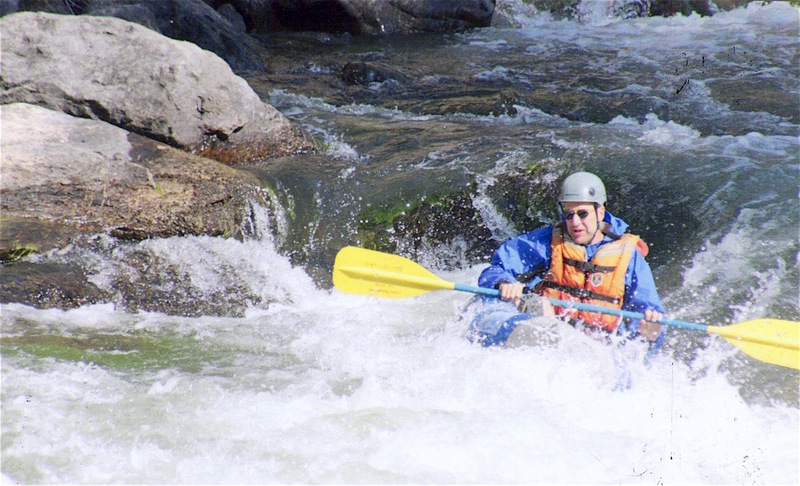 After corporate programs work, with New York City Outward Bound and Chicago Center founder Steve Proudman, I eventually lost any formal ties to Outward Bound. And so it was an Outward Bound homecoming of sorts, as I worked with other alums this past weekend, to build raised beds for the students of Polaris Charter Academy to grow food this Spring. Polaris is one of 160 “expeditionary learning” schools that are grounding in neighborhood elementary and high schools the experiential learning principles of Kurt Hahn, refined through more than 60 years of Outward Bound wilderness practice. Polaris students, grades k-2 (so far), learn by doing. By getting out and exploring, finding out for themselves where food comes from, and where garbage goes. Learning to read and write and count and present in the process of exploring the World. In many ways, from personal backcountry tripping and seventeen years of sole proprietorship, to my frequent framing of Open Space as a sort of wilderness expedition inside of organization, I really have been Outward Bound all along. To see my OpenSpaceTech and OpenSpaceWorld sites, I’ve certainly been educator. But I’m Outward Bound all over again these days — coming home from the wilderness, coming home to the wilderness, and wilderness coming home to Chicago, all at once. Confidence and Community. Ground touching ground. Breaking new trail in rugged old boots. There is talk of two more expeditionary learning schools coming in Chicago. And of restarting the Chicago Center. I’m looking forward to an organizing meeting next month. more at www.manudelago.com and been listening here while i work today. 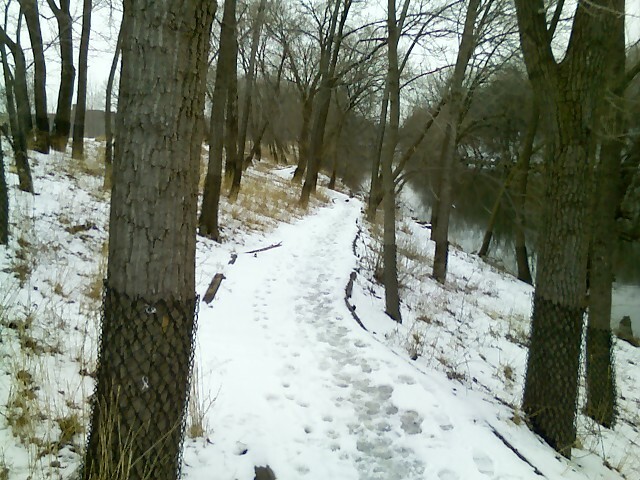 This trail is about 200 feet from the back door of the 1924 bungalow we now have under contract. We’re thrilled about the new place and totally immersed in the logistics of moving and rehabbing, on top of all the usual business. Before we move, I’ll also be heading off for ten days in South Africa, to work with corporate and community groups. Expect slow blogging ahead. But here’s a remarkable piece of music to watch in the meantime. Stringfever, the world’s first genetically modified quartet. Julia Butterfly Hill asks What Is Your Tree? After meeting with Jean Russell, Michael Maranda and Julie Peterson all afternoon, I think Inviting Neighborhood Leadership is my tree. One of my trees? I spent my Sunday evening with Bliss and Howell Browne, celebrating of their 30th anniversary and Howell’s birthday. After several rounds of conversation and an delicious dinner, with no introduction at all, in the middle of so many conversations all going at once, Claudia Schmidt walked into the living room. Eyes all a sparkle and a mischievous grin, she let fly with song and story. A capella at first, later with dulcimer, and then guitar, she filled the place with song and light and the admiration of all. She’s really something special and will be performing next Sunday at Bill’s Blues in Evanston, 7:00pm, Davis Street, I think. Here’s a quieter sample of her music from her website. 2.0 billion people have to go outside of their homes to get drinking water. 1.2 billion of those go out to get water that isn’t even safe to drink. 600 million others have unsafe water piped into their homes. That’s one third of all people on the planet without safe water to drink. In Bangladesh the situation is even more acute. 46 million choose daily between arsenic-poisoned groundwater (arsenic at 30 to 50 to 100 times the EPA and WHO safe limits) and bio-contaminated surface water. Most choose slow death by the poison over a swifter death by disease. Ashok Gadgil, interviewed by Massive Change in November, 2003, is working directly to solve these things. An environomental physicist, he’s invented kiosks for UV purification of water and is now working on the arsenic issue. Refreshing and heartening to hear him talk about his work at the intersection of planetary life science and human-scale social interaction, a quieter ground between warming alarms and techno buzz. The point is that this is brand new Life tech AND it fits easily into how people already Live. That’s the unit on the wall behind the people in the photo. The end of a long week left me crazy restless Friday night. Needed to move. I told Jill I wanted to go ice skating (of all things) but the big City indoor rink doesn’t rent hockey skates. So that was out. As a last resort, I went out for a long walk along the Lake, in 4 degrees of cold, not counting the windchill. Walked all the way downtown to Monroe, about 3 miles, where I was suddenly inclined to turn back into the City. At Michigan I turned back north, with no conscious destination in mind. Two blocks later I stumbled onto the new Millennium Park rink! I had only a light pair of cotton socks, so I couldn’t skate. But I dragged Jill back, in that same freezing cold, for her first-ever skate, last night. I loved it so much I went back today for four hours. I grew up just north of Canada… in Detroit, that is. Dad used to flood the backyard for us to skate. Later we skated at a local rink. Must have been sixth grade, my family went to a Superbowl party at an ice rink. I spent the whole time trying to learn to do crossover turns. I fell a thousand times. Never did get the turns figured out. But the next time out, like magic, I could do them. Same magic this year. Last night felt a bit stiff and unstable. Today, I’m bobbing and weaving and turning all over the place. As good as ever. What a blast. And what is it about this crazy machine? Such fun to watch all the little kids mesmerized by the magic of it. This kid too. This comes from Alistair Cockburn’s book on Agile Software Development, via Deborah Hartmann’s RichDistributedCollaboration page in the BarCamp wiki. I guess it goes without saying (or drawing) that effectiveness goes stratospheric when you get 2 people together at a bar, with a pile of cocktail napkins to scribble on. For three years, I have had the opportunity to work with peaceful development leaders in Nepal. 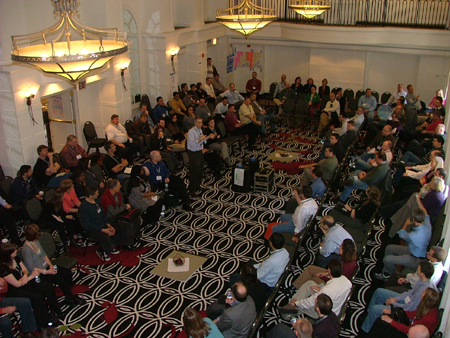 In my last visit we did a four-day, national, Open Space and Appreciative Inquiry conference and training summit event. Most recently, the Maoists have attacked the village of one of the main leaders of the group. This photo is one result and the invitation below is another. Now we are suffering from difficulties. our some pride were gone with palpa attacks. 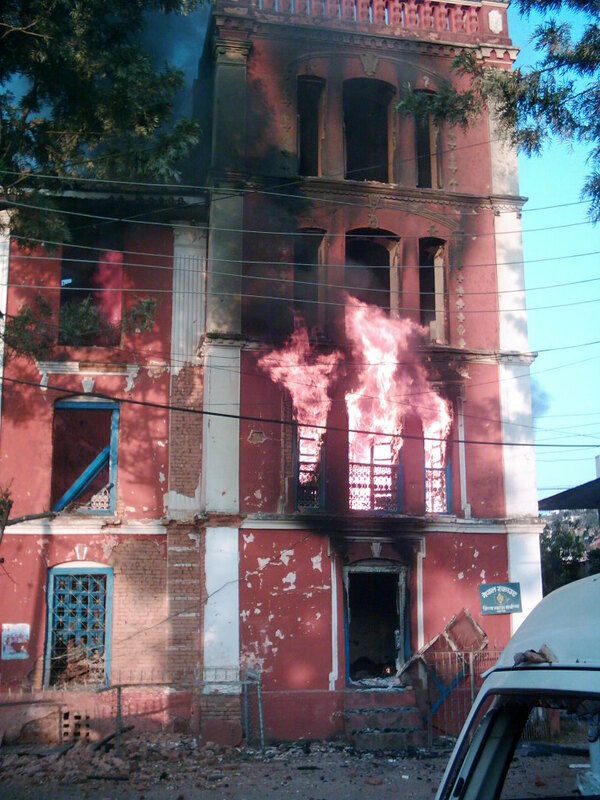 it was did by Maoist on January 31, 2006. now we are make a team for reconstruction. so we are appeal to all you to support us for reconstruction. we are going to Tansen summit for Imagine new tansen through open space technology. after that we provide you our master plan. History, no matter where it is, the wealth of people of the whole world. A smallest unit of something can be a big insight in the future. It’s our duty to preserve and protect the identity of human civilization. In this context, Nepal Appreciative Inquiry National Network (NAINN) wants all to recall the destruction took place in Tansen, Palpa on 31 January 2006. The tragedy was not expected. The world runs in complexity and in chaos. So it happened and now we all are bound to accept the damage. The attack form the Maoist destroyed a century long living history of Nepal. Asia’s biggest gate is lying on the ground with its seared body. Many historical and archeological things were engulfed with fire. The old building, which was supporting the government offices with pride, is now roofless, door less, windowless and with broken pillars. The surrounding is damaged as well. But there is still hope. The structure is not completely ashed. The people of Tansen are not hopeless, we Nepalese people’s energy is not swallowed by the fire and bullets. We have hope that the Palpa Durbar comes into its original outlook within a very short time. It’s the dream of Palpali and whole Nepalese people. And we are sure that our dream comes true since we have the sympathy from national and international government, organizations, I/NGOs, supporters, people and all the well wishers. A very good news to all of us is that a Tansen Reconstruction Team, led by Mr. Ram Bahadur Raut (National Chairperson of NAINN), has been formed very recently in Tansen, Palpa. It’s right time to contribute for the revival of the identity of whole human beings. Nepal Appreciative Inquiry National Network (NAINN) requests all National and International governments, NGOs, INGOs, Donor Agencies, people and well- wishers to make a contribution from your side so that Tansen Durbar can resurrect very soon. A small drop of water, if collected from many, can fill a large pot. The view from the ground of my retreat last week. Was it really just last week that I was resting in these trees? Aaahhh…. And thanks to Jason Whitlow for the photo.